Finally I managed to create the FB account for PBSNS. It is loaded with photos since 2003 even before PBSNS was incorporated. Do take a look and when you are there please 'LIKE' us and SHARE the pages so that more people get to see our work of helping the less abled folks in our society. While I'm at it I want to also update you on our fund raising dinner on October 26 2013. Here's a snapshot of the dinner ticket. 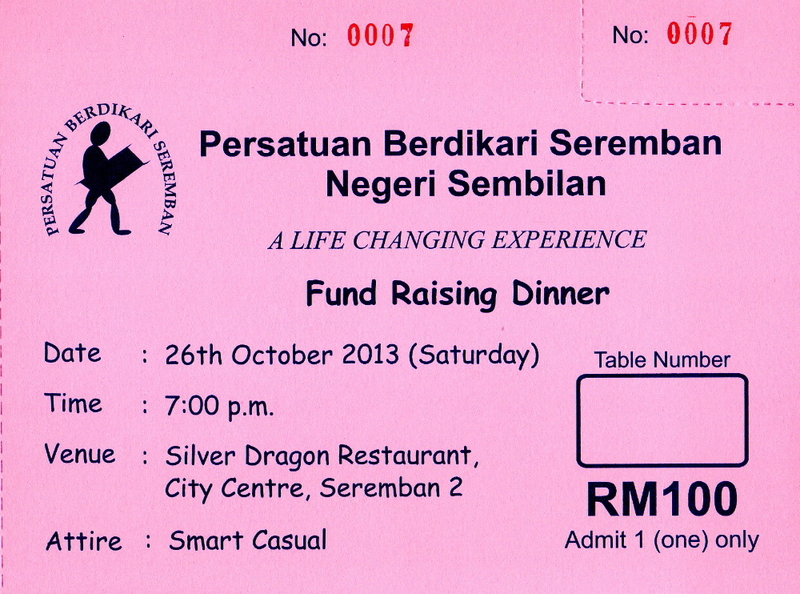 Do support us by either making an outright donation or buying the dinner tickets. Donation can be of any amount and will be acknowledged with a tax exempt receipt. As an incentive if you donate RM2000 we will throw in a free dinner table and a tax exempt receipt. It is a really good deal as we have engaged top gospel singer Juwita Juwito to entertain us that evening. 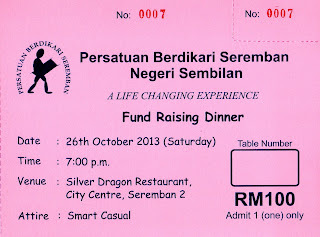 If you choose to just buy dinner tickets the cost is RM100 per seat or RM1000 per table. For these we will not issue any tax exempt receipt. Tickets are available by calling Betsi at 06-7632005 or emailing her at pbssbn@gmail.com. 381, Jalan Kenanga 1, Taman Bukit Chedang, 70300 Seremban with your name and address so that we can mail you the tickets and receipt. The date may be 5 months away but as we have only maximum 65 table capacity in the ballroom we encourage you to purchase early to avoid disappointment.